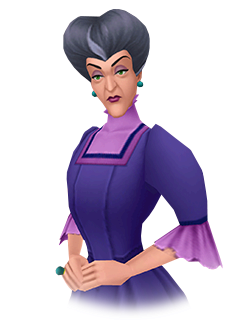 Cinderella's stepmother and self-proclaimed mistress of the household, Lady Tremaine is a selfish, cunning woman who showers all affection upon her daughters and pet cat, but has none to spare for her own stepdaughter. Fearing that Cinderella's beauty will overshadow them all, she bullies the girl into becoming a maid and does anything in her power to ensure her family's superiority over Cinderella. Suspecting that Cinderella is the girl the prince danced with at the ball, she locks the maiden away in her own room when the Grand Duke arrives with the glass slipper. When Cinderella is free, she craftily trips the Duke and shatters the slipper, hopefully eliminating any chance of Cinderella being found out as the prince's dream lover. Enraged when her stepdaughter is able to produce a spare, she gives into the negativity in her heart and transforms Cinderella's pumpkin carriage into an Unversed with the intention of killing Cinderella. Her own darkness ultimately become her downfall when the Unversed turn on her and her daughters.